Traveling long distance can be tiring, especially when it’s an overnight flight to Asia or Europe. So it’s well worth the time and effort to get the best seat you can afford, because you’re going to be in that seat for more than 10 hours. Fortunately, most travelers can sleep on these red eye flights, cutting 7 or 8 hours out of the boredom. But it’s hard to sleep, when you’re jammed in a full flight and people keep crawling over you to get to the bathrooms. So think about an upgrade, whether you have to use frequent flyer miles or pay more. The extra room and service will more than pay for itself. Remember, you’d probably have to pay $400-$500 for a night at a nice hotel in a capital city. Why not invest that in the flight? So when we booked our nonstop flight from London to Los Angeles, we wanted as much bang for our buck as we could get. Air New Zealand was offering roundtrips for as little as $800 over the winter. First we looked at the Skycouch formed from three seats in your own row. The ergonomically designed seats feature a swiveling headrest plus individually equipped AC power. Fleece blankets and pillows are free. The Skycouch is formed when you raise the two position leg rest on each seat. When they’re level with the seat, just raise the armrests and you have a large flat couch more than 5 feet long. Great for cuddling up with a loved one for the long flight. 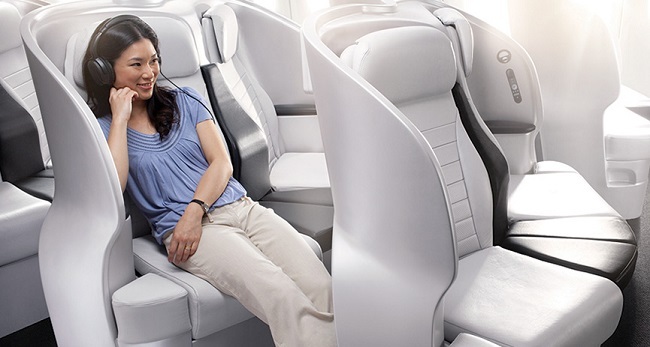 But then, we saw the new Spaceseats in premium economy and had to try them. The innovative design solves many of the issues that pop up in today’s flights. Sure the cost is double economy, but it feels like you’re getting three times the space. Nestled in a hard shell, the seats keep the person in front of you from intruding on you personal space. That means a seat back won’t be reclined only inches from your face for 10 hours, and the tray table won’t be nudging you chest while you try to eat something. And the center seats are designed for couples, who can actually turn to face each other over meals. The two seats in the outer rows cater to travelers who prefer privacy. The seats are staggered, so you’re not looking at the flier beside you. And there are several innovative storage spaces in the armrests so you don’t have to jam all your electronic equipment in the seat back. The complimentary headsets are very comfortable, accessing more than 580 hours of content, including the latest movies. There’s also television shows, video games and a special children’s section. All on a 10 inch touch screen with a widescreen format. If you need more, there’s USB and iPod connections you can plug into. While the Spaceseat doesn’t recline completely, it swings out enough to allow a restful sleep, blanketed in cozy fleece blankets and pillows. So you can actually arrive at your destination well-rested and ready to start the day, not a zombie looking for your hotel. The food in premium economy was also quite good, the chefs obviously put some thought into the special menu. It’s nice to eat with real silverware and drink from actual glasses. Of course, these meals come with premium New Zealand wines. If you’re still hungry, fliers can order a snack directly from their personal screen. My seatmate, a British retiree with a home in New Zealand swore by the new service. He said it’s the only way he’ll fly now. In the end, the long flight became more of a treat than a chore, and we arrived in Los Angeles well-rested and fed. Ready to tackle the busy freeways in Los Angeles. This entry was posted in air new zealand, Destinations and tagged air new zealand, london, los angeles, spaceseat by Richard Irwin. Bookmark the permalink.